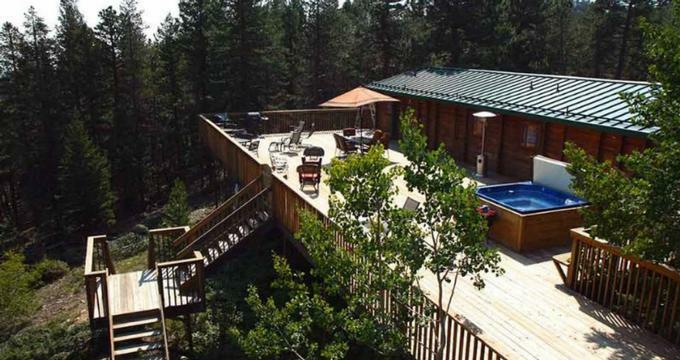 Tucked away in Wondervu in the heart of Golden, Colorado, Eldora Lodge is a lovely mountain ski lodge and retreat that offers comfortable accommodation and a plethora of outdoor activities. Guests can enjoy bed and breakfast lodgings in cozy log cabins, which are fully equipped with en-suite bathrooms and modern amenities, including climate control and flat-screen televisions. Soak in the hotel’s hot tubs after a day of skiing or warm up in front of the crackling fire in the lounge before heading out to enjoy one of the many activities on offer. Enjoy hiking, fishing, mountain biking, skiing, or snowboarding. Wildlife lovers will delight in the plethora of birds and wildlife to be found in the region and romantics can stargaze on clear nights. Eldora Lodge features ten well-appointed and comfortably furnished mountain-lodge style rooms with rustic décor, log furniture and finishings, and warm hues. All rooms have queen-size canopy-style pillow-top beds dressed in high-quality linens, thick comforters and plush pillows, and en-suite bathrooms with rain showers, double or single vanities, fresh towels, and branded toiletries. In-room conveniences include flat-screen televisions with cable channels and BluRay players, mini-fridges, microwaves, hairdryers, irons and ironing boards (on request), and ceiling fans. All rooms have access to the shared deck where there is a hot tub for guests to enjoy. The Honeymoon Suite is more spacious than the standard rooms and features a lovely sitting area with a gas fireplace, a wet bar, and a private dry sauna. This suite has a private fenced deck with a hot tub for two. Amenities at the Eldora Lodge include a delicious complimentary breakfast served every morning, relaxing hot tubs on a shared deck for all guests to use, an entertainment and recreation room with a pool table, darts, and comfortable seating, and a media room with a big screen television and DVD player. The lodge has a large deck with spectacular views, a wood-burning fireplace, and a smoke-friendly TeePee with a fireplace. Outdoor games include basketball and horseshoes, and there is complimentary wireless Internet around the property. Located between downtown Golden and downtown Boulder in Colorado, there are a plethora of things to see and do for all tastes, from arts and culture to outdoor recreation and adventures. Visit the Eldorado Canyon, State Park. One of Boulder County’s most spectacular natural treasures, Eldorado Canyon State Park is an outdoor-lovers’ paradise and has something for everyone. From hiking along the magnificent sandstone cliffs to fishing in the South Boulder Creek, this day-only park is frequented by locals and tourists who come to take in the breathtaking scenery year-round. Eldorado Canyon State Park is home to some of the best rock climbing in the world and offers over 1000 technical rock climbing routes in and around its ‘golden cliffs.' But it’s not only climbing that draws the crowds. South Boulder Creek is ideal for fishing, paddling, swimming and picnicking during the warm summer months while winter sees cross-country skiers and snow hikers enjoying the scenery. The state park is open during daylight hours only, and visitors must leave before dusk. There is a small entrance fee to the park and is best experienced in the colder months without the crowds. Experience Colorado’s unique and delicious cuisine with a fun-filled foodie tour. Local Table Tours is a food tour and event company that offers a variety of culinary tours and experiences around Boulder. Food tours are led by local foodies with a passion for Boulder and its culinary delights, and visit places such as The Source, one of Denver’s one-stop foodie spots, where gourmands and food lovers can taste their way through a variety of esteemed establishments, including Mondo Market, Acorn, and Comida. Local Table Tours also offer cocktail tours for those who want to appreciate the art of cocktail making, with private cocktail classes and plenty of samplings. Other tipple tours include visits to the Crooked Stave Artisan Beer Project and Proper Pour to savor some of Denver’s best-handcrafted beer and other beverages. Tours are generally between 1-2 hours, and comfortable walking shoes are recommended.